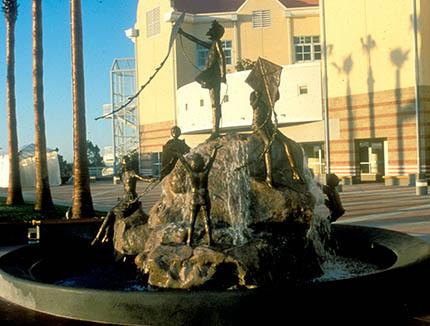 Several years ago, Rady’s Children Hospital commissioned me to create a fountain for it’s main entrance, something using the theme of children interacting with water. That aspect of the sculpture however, becomes the secondary source of dynamic tension in the composition, which I solved by creating a hill for the water to run down. The hill itself became an element to capture a more ethereal source for tension-the wind itself. Several children reach eagerly in to the wind with kites. Kites give the children a sense of unity with the wind, a feeling of lift beyond the earthen floor to which gravity binds them. Altogether there are seven children. The first two are a boy and girl who help each other up the hill. The second two hold a kite and their gaze extends to the top of the hill itself. The third, a singular figure, is a small boy who reaches his arms upward toward the summit where the oldest children are positioned with their kites. They are the oldest children in the composition. The boy is seated on the edge of the hill, testing the wind. The girl is standing at the highest point, reaches into the wind with her kite. Its tail flutters outward, her skirt pulls her into the breeze, and far below the little boy hungers for the experience which the others introduce into his awareness.